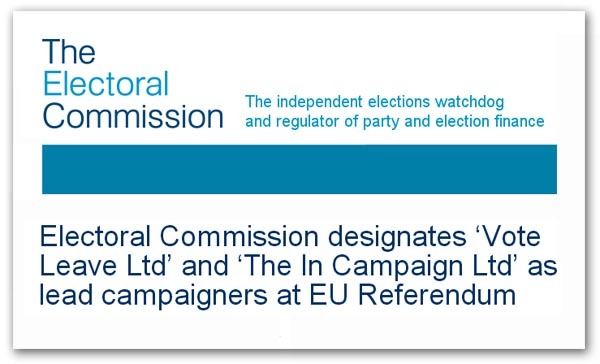 With the formal designation by the Electoral Commission of Vote Leave Ltd as the lead campaigner for the “leave” proposition, a chapter closes on this referendum. There has also been a “remain” designation – Stronger In – although this matters little. The lead campaigner for the remain proposition is Mr David Cameron, with the full resources of the Government at his disposal. The Electoral Commission’s decision represents a defeat for the aspirations of Mr Arron Banks, his Leave.eu operation and the “GO Movement” which he was latterly instrumental in setting up to front his designation application, alongside Nigel Farage and a number of MPs. It also represents a major failure for Mr Farage who has had 17 years as an MEP to prepare for this eventuality. Yet, despite his expenditure of millions of pounds over term, he has been unable to bring together a coalition capable of gaining the Commission designation and taking the lead role in the campaign for which his party exists. We now have the extraordinary situation that the leader of the only party set up specifically to campaign for our withdrawal from the European Union is relegated to a secondary position, while a London-based largely Tory group of opportunists take the pole position. As to our role as Leave Alliance, and mine personally as proprietor and editor of EUReferendum.com, the premier, dedicated anti-EU site in the country, I will deal with the latter first. On this, keen-eyed observers will notice that we do not feature in either the Vote Leave or Go Movement applications, as part of the respective teams. This is not for want of trying. When in September 2015, I last met Mr Cummings, then campaign director of what was already Vote Leave Ltd, we had agreed to work closely together, and parted on cordial terms. Shortly afterwards, I learned through a third party that there were [unspecified] issues emerging. Cummings was asked to contact me to explain, and I was asked to write him a note explaining my position. I did the latter, writing a note which remains unanswered. I have not heard from Mr Cummings, then or since, or from any officer of Vote Leave Ltd. Typical of Vote Leave’s respect for the truth, however, the meetings with Cummings have been used in their designation application, implying they are supporting campaigners such as ourselves (see below), and respecting out views(See Section 4). By some, this reference is being taken to suggest that I am somehow aligned with Vote Leave. But that is totally misplaced. In fact, in early January of this year, I met Mr Arron Banks, in his offices in Bristol, together with Andy Wigmore, for the second time. As a result of that meeting, I wrote and then published with the full agreement of Leave.eu (after Andy Wigore had seen and approved the copy) this press release. In this, I wrote that I had agreed to work with Leave.eu as a consultant for the duration of the EU Referendum campaign. As part of the package, Leave.eu had decided to adopt Flexcit as their formal exit plan, subject to a rebranding exercise which I agreed to work on. The provisional working title for the plan became: “The Market Solution” (or TMS for short). I wrote also of assisting Leave.eu in marketing the plan, and in running seminars in Bristol and elsewhere to introduce the plan to Leave.eu staff and to a wider audience. Also, I was to provide political intelligence – particularly in relation to the EU – and assist the campaign in any other way I could, especially in respect of the designation. In a very short period, I delivered to Arron Banks a redrafted copy of Flexcit. It had the logo of his organisation, re-entitled The Market Solution, with all the consequential amendments made to remove any reference to Flexcit. As a goodwill gesture, I posted it on the EUReferendum.com website. It is a matter of record that I received no formal (or any) acknowledgement. After a few weeks, having not heard anything, I told Banks I was willing to meet anywhere convenient to him, at short notice if need be. No meeting was ever arranged. Furthermore, after two modest retainer payments for this year, consultancy payments have been stopped. When the GO Movement was set up, I was not invited to join it. I was not even told about it until it had become public knowledge, whence David Bannerman and Ruth Lea were appointed as advisers – both of them hostile to Flexcit. Despite promises to explain the situation, I heard no more from Mr Banks. Latterly, Andy Wigmore, when asked by The Boiling Frog why Flexcit had not been used, claimed that I had not allowed its use. Challenged, by me, Wigmore withdrew that lie. As to the Leave Alliance, we wanted to talk to Mr Banks. He was even invited to our launch – but he did not respond to the invitation. The Alliance, therefore, retains its separate identity as a registered campaigner, as do I and the other component members. Understandably, we now see on Twitter and elsewhere expressions that, now the lead designation has been decided, we should forget past enmities and work together for the common cause. This is partly why I’m making this statement – to clear the air before we commit to the final run. I need to place on record the fact that we have always been willing to work with others. Where there have been problems, it has quite clearly been the other groups’ refusal to work with us. In the case of Vote Leave, we found them taking hostile acts against us which have seriously damaged our standing and our finances. Nevertheless, we are still prepared to work with all comers, but now, it is on our terms. We will fight hard, long and with all our skills and energy. This is the last piece of this nature that we will write until after the referendum, and our total focus is now on winning the battle. Despite that, we do not expect to hear from Vote Leave – that is not their style: they have all they needed from me. They got what they wanted. But then they always were self-centred, aloof and exclusive. That’s why so many people have serious reservations about them. Banks, on the other hand, is essentially a busted flush – having spent (he claims) £8.5 million on his attempt to gain designation. We have had £20,000 into the kitty (although some has already been spent) but I guess we will get more value for money than either Vote Leave or the GO Movement. Already, EUReferendum.com has more traffic that their two websites combined, we have now topped 60,000 downloads of Flexcit and the pamphlet will shortly have sold out and need a reprint. All this has been on a shoestring, from what was formerly by daughter’s bedroom in our house in a suburb of Bradford. It could not have been done without the dedication of Mrs EU Referendum, and the help of our good friends, readers and supporters. Let no-one say that we didn’t try our best. Battle is formally joined on Friday when the regulated referendum period starts. It is then full steam ahead, with all guns blazing. We’re not any longer prepared to contemplate anything else but winning so, until well after 23 June, I would not advise anyone to get in our way.